Tattoo Artist. 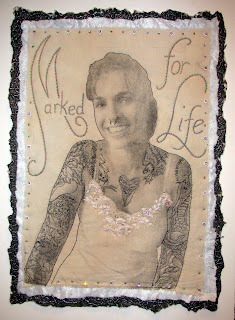 Stitched words: Marked for Life. 25" x 18", unframed. Xylene transfer on tea-stained muslin. Hand stitched and beaded with free motion machine embroidery and snippets of lace. I've been working on several pieces this week including this piece in my Decision Portrait series. It was my intention to bring out the sitter's youthful beauty and femininity. I'm pleased with the result but not necessarily the photo. It has been nearly impossible for me to take photos here at the MacNamara foundation. I generally like natural lighting. Its often been rainy and there's no place for me to really hang the work outside when it isn't raining. However, if you look closely, I think the pastel pinks and sea foam greens are there. The coloring adds to the sense of femininity as does the lace on her bodice...which really looked like the lace she was wearing. I know this single mother, business owner (Body Rites of Columbia, SC), and artist from last year's Skate and Create exhibition at Gallery 80808/Vista Studios. Without her skillful organizational skills and discerning eye, the art show would never have looked as professional as it did. It seemed fitting that I was finishing this piece this week. Earlier Friday evening, the 2nd Annual Skate and Create exhibit opened. I'm actually the "sponsor" but obviously couldn't attend. I finished my altered skateboard before leaving for Maine. In my absence, my wonderful husband Steve filled in. I hope the show opening went well; actually, I know it did.....this talented tattoo artist hung the artwork again this year! Skate and Create isn't the only show I missed on Friday night. 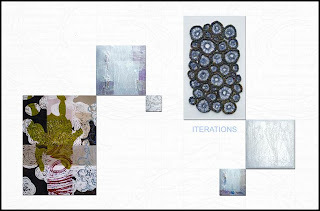 Sharon Dowell curated a show at Mark's Gallery, 2908 Crosby in Charlotte, North Carolina. She selected me! Four of my Strata Series and one of my Geodes went on view today! The name of the exhibit is Iterations. It features four female artists: Julie Benda, Petra Carroll, Jennifer Parham Gilomen, and me! Also, in Greenwood, SC there was an opening at Meridian Gallery. 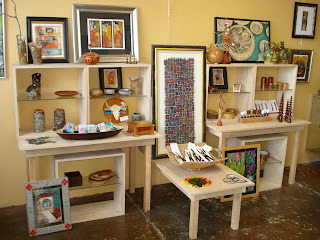 I have one "In Box" piece there and was sent a photo which is below. In the meantime, I've been busy creating art everyday...all day...heavenly. This has included some rather odd experiences including harvesting porcupine quills from a recent roadkill near Damariscotta, Maine. Below are two of my fellow artists here at the MacNamara foundation and the dead porcupine. I think someone else got to this dead animal before we did as there were no really long quills....but there were more than enough short ones. 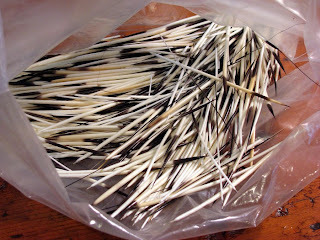 I pulled only a small fraction of the quills...hundreds and hundreds of them. How many quills does a porcupine have? It took me a full morning to wash and separate the quills from the fur but it was worth it. They are beautiful. I have several ideas for them. Another natural wonder here in Maine is the abundance of acorn caps. After creating my "In Box" variation using a few, I went "nuts" for them. Below is a basket full. Each one's stem has been snipped off and a hole was made. 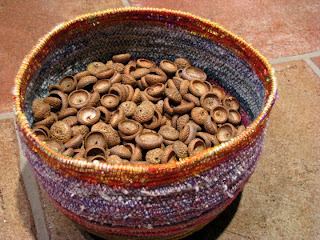 Thus, this is a basket of acorn cap beads! I have ideas for these too! Hopefully, I'll get some sun and some good photos of my latest work. I promise to post these works soon! I really enjoy following you and your work while you're in Maine. The portraits are great! I can't believe how much work you get done in a day. You are amazing! A truly beautiful portrait of the young illustrated woman! 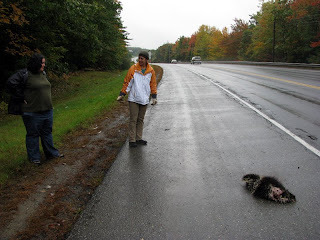 I'm glad i'm not the only one who scouts Roadkill!!! Very cool! That porcupine will live on in your art! What an awesome addition to the Decisions series...my person favorite! OK....I'll look for roadkill things for you but I need to get rubber gloves or something! I can just see you out there picking it over!!! Great mental picture!